Another Mystery Photo: The Caption Reads "Scene at the Village Well, between 1898 and 1946"
Can anyone identify the three? 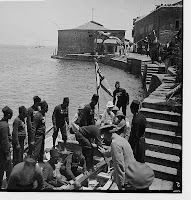 With more than 22,000 American Colony photographs in the Library of Congress, the fact that most of them are catalogued, digitalized, captioned and dated is a major tribute to the curators. The photos were taken between 1880 and 1946, but the American Colony photographers also collected older pictures, such as the one at the top of this page from the1860s. But sometimes, the curators just don't know, as was the case with this picture. 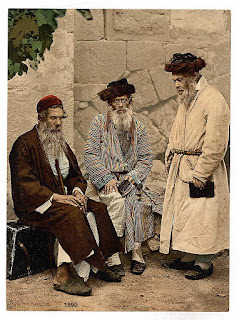 In one copy of the photo the caption reads "Village Elders at the Well." 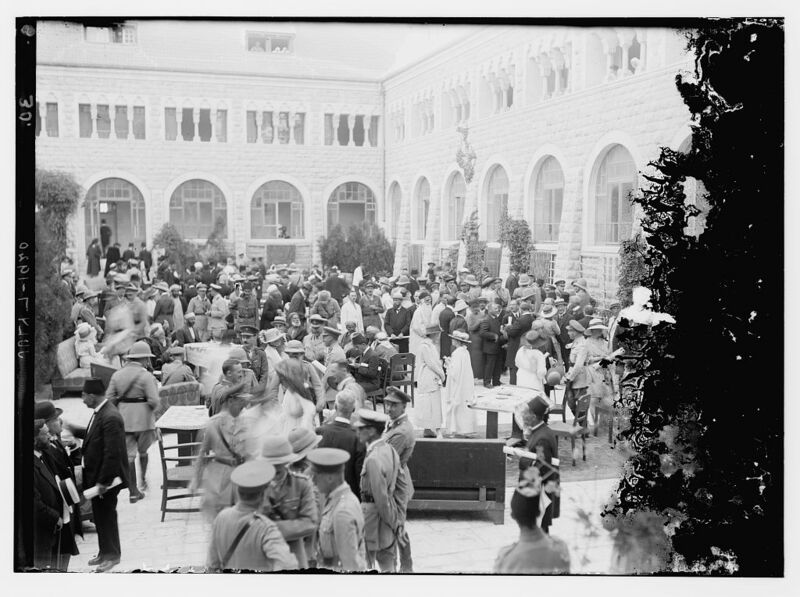 Well, we know exactly when and where the photograph was taken: July 7, 1920 in the garden of the Government House where the new British High Commissioner, Herbert Samuel, introduced himself and read a proclamation announcing the end of military rule in Palestine. Earlier postings of Israel Daily Picture presented pictures of Samuel's landing in Jaffa two weeks earlier and the reception at Government House. ﻿The July 7 reception brought together dignitaries from the Jewish, Moslem and Christian communities, and it is evident that the three "village elders" in the mystery photo were part of the audience. 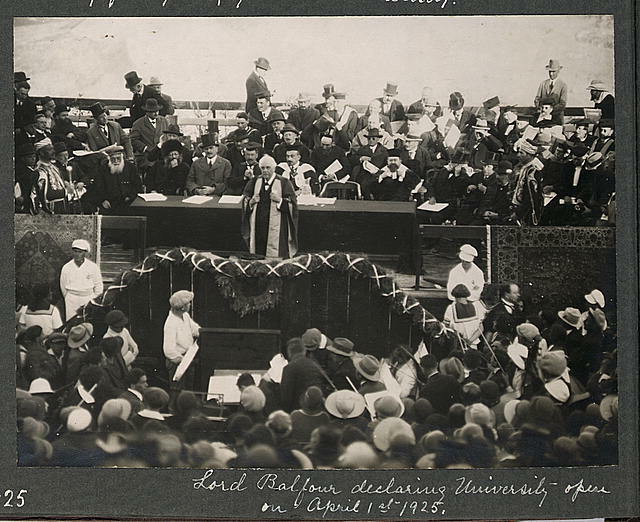 The man on the right with the bowler hat is holding a copy of the proclamation distributed to the audience. 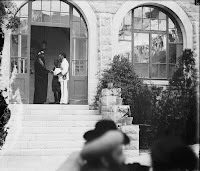 The "elder" on the left appears in the foreground of a picture of Samuel greeting the Sheikh of Be'er Sheva. Subscribe to receive the Israel Daily Picture via email. Enter your email address in the box in the right sidebar. It's free. More on the 1876 Photo Fraud. Part of an Anthropology Gallery? 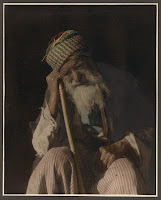 The 19th century photographers in the Middle East loved to take portraits of the local population in their native surroundings and native costumes. 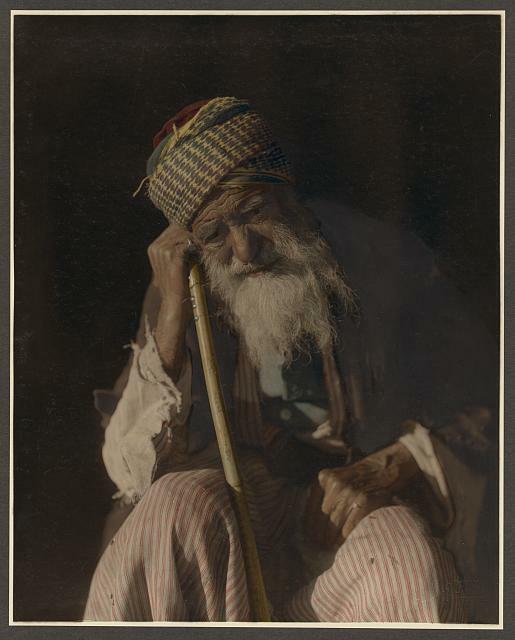 Hundreds of photos in the Library of Congress collection show Jewish men and women (and here), Arab men and women, the Maronite patriarch, Bedouins, Samaritans, Armenian monks, Druse, etc. in their native and ritual clothing. We thank our reader "Yoni" for submitting the following comment, adding to his startling revelation that the photo of the "Ashkenazi Jews" was fake. 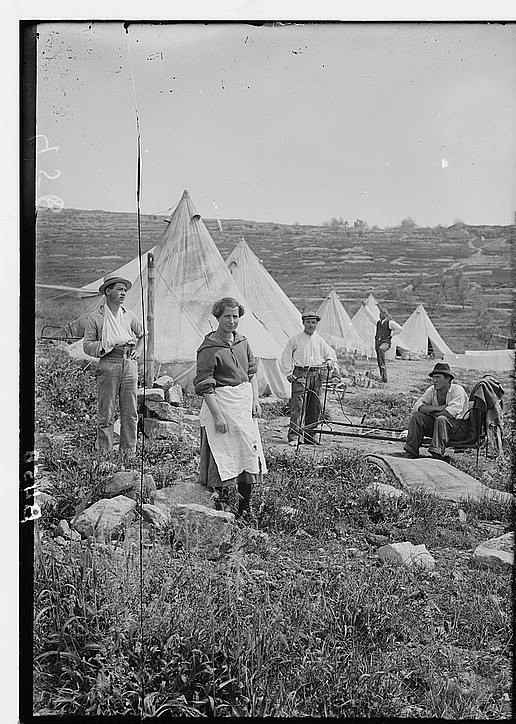 The photo "Ashkeanzi Jews" was taken by Sergeant Henry Phillips, R.E, the photographer of the Palestine Exploration Fund’s expedition led by explorer Lieutenant Charles Warren R.E. There are other versions of this picture with the "actors" dressed differently and in different locations, such as the photo published in Warren's "Underground Jerusalem." Armenian priests or are they actors? As for the hotels; The Mediterranean hotel had three different locations (see Gibson and Chapman 1995). 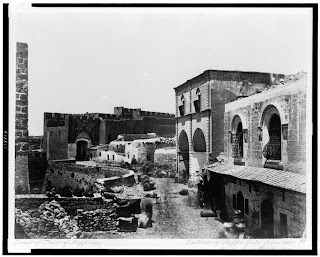 Between 1849-1866 it was located at the south eastern side of the Hezekiah pool, Between 1866-1870 it moved to El-Wad street (currently known as Sharon House or Beit Witenberg) and in 1870- 1885 it moved towards the Jaffa Gate and occupied the same building as the Petra Hotel today. Therefore, the Ashkenazi Jews photo was taken in the second location in 1867, when the Warren expedition was based there. The full story will be available with the publication of the Book. As Yoni pointed out, Mark Twain and his colleagues stayed at the same Mediterranean Hotel in the Old City of Jerusalem as the Palestine Exploration Fund's explorers. A question for Yoni: Were the actors' pictures taken in 1876, as per the Library of Congress caption, or in 1867 when Warren undertook his expedition to Jerusalem? 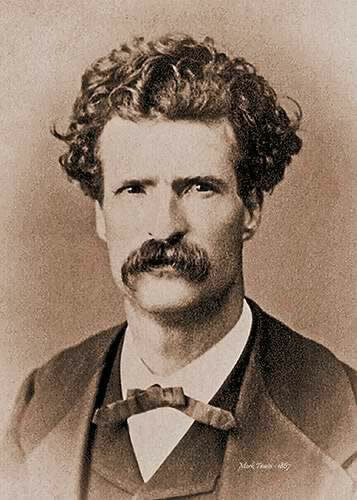 Both Twain and Warren may have been at the same Mediterranean Hotel at the same time. 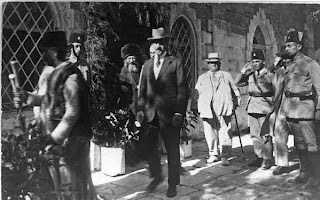 Click here to see possible pictures of Twain's colleagues in Jerusalem. Illus. 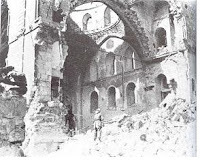 in: Underground Jerusalem: an account / Charles Warren. London : Richard Bentley and Son, publishers in Ordinary to her Majesty the Queen, 1876, oppos. p. 359. It does seem that the photographer did not have people of faith to represent the diversity of Jewish, and Christian Orthodox in the city and therefore used actors /extras, and dressed them in the different costumes. I would not call this a "Fraud" but rather creative posing to tell the story. 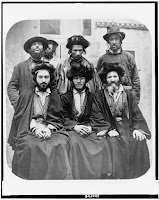 Was the Ancient Picture of "Ashkenazi Jews" a 136 Year Old Fraud? Were these "Ashkenazi Jews" really actors? 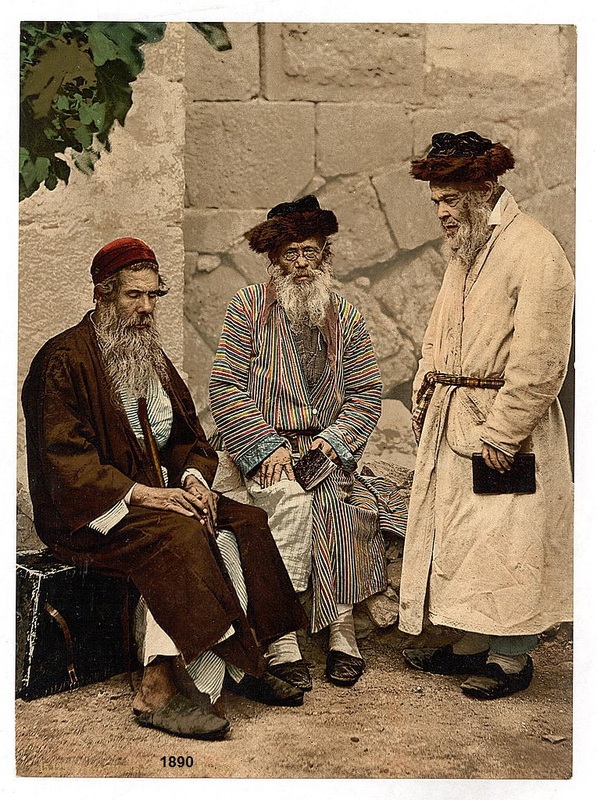 The picture named "Ashkenazi Jews" (1876) was taken in the Mediterranean Hotel courtyard located on Hagai St. in the Muslim quarter of the Old City. The keys holder is seen in back on the right hand side and show the place for 22 keys. 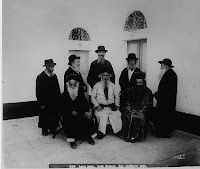 The "Ashkenazi Jews" in the photo are actors dressed up as such, and in another picture taken in the same location they are dressed as Christian characters from Jerusalem. The hotel is described in Charles Warren book "Underground Jerusalem" and housed the P.E.F expedition in 1867 as well as the famous writer Samuel Clements (Mark Twain) on his tour in 1867 well documented in the travel book "Innocents Abroad." 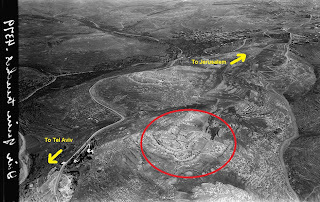 The location of the hotel was found several years ago By Yoni Shapira, and in collaboration with archeologist Dr. Shimon Gibson and Dr. Rupert Chapman the story will be published by the P.E.F. 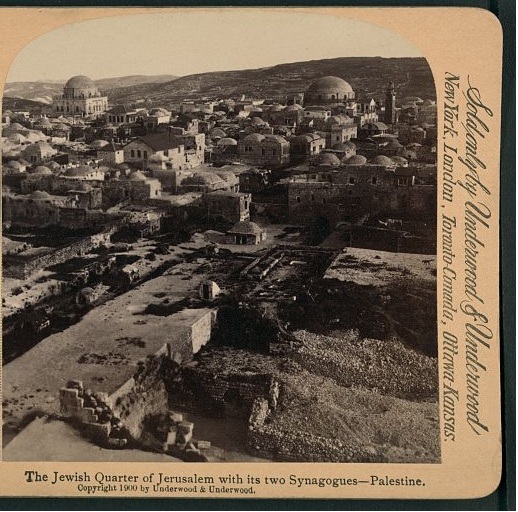 later this year in a book called "Tourists, Travelers and Hotels in Nineteenth-Century Jerusalem." Thank you, Yoni. Indeed, some of the photograph's subjects don't quite look "kosher." 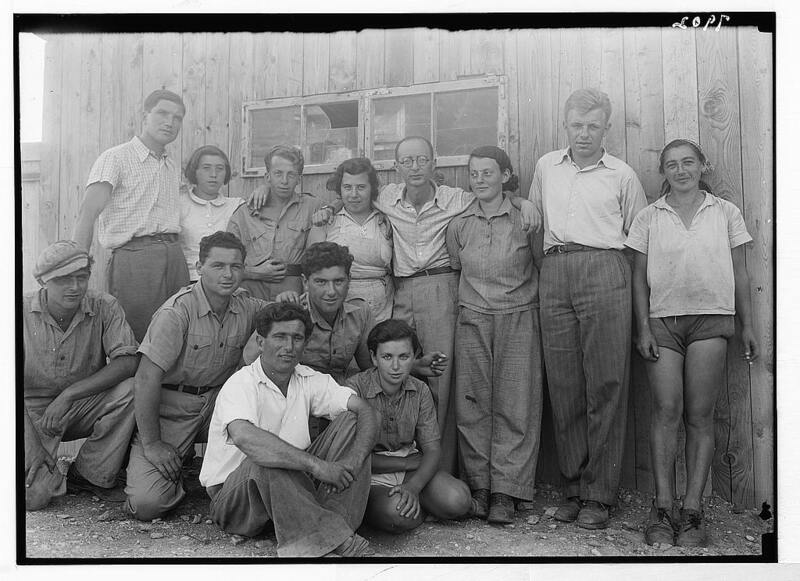 We present below two photographs from the Library of Congress collection with references to the Mediterranean Hotel, taken in the same time period as the "Ashkenazi Jews." 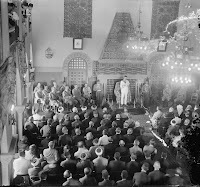 of the Knights of St. John, from the Mediterranean Hotel"
The State of Israel was proclaimed on May 14, 1948, the fifth day of the Jewish month Iyar. But Eretz Yisrael has been the homeland for the Jewish people since the days of Abraham. 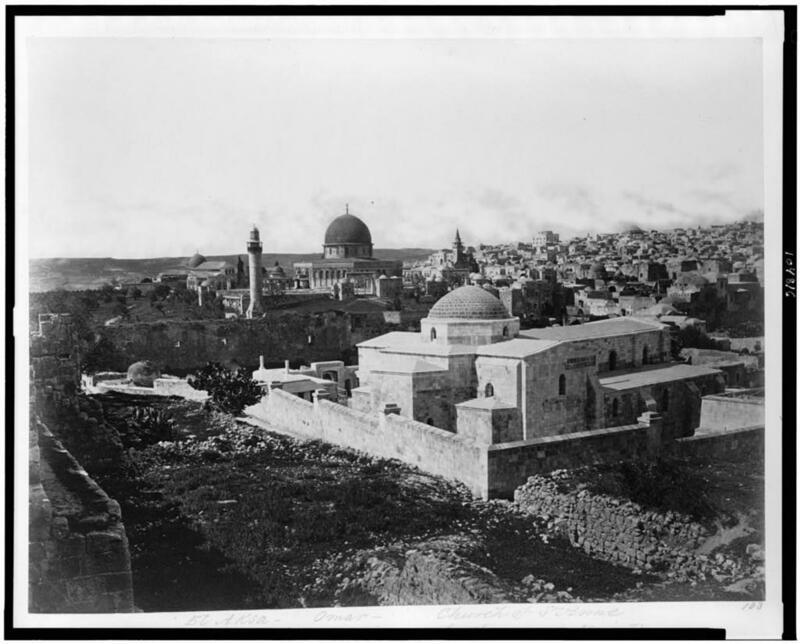 Even after the destruction of the second Temple in 70 CE, Jews continued living in the land, as evidenced by the writing of the Jerusalem Talmud over the next 400 years. 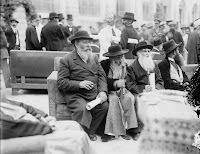 Zionism, the modern Jewish nationalist movement is some 130 years old, but the longing for the Land of Israel is as ancient as the Jewish prayers to return to Zion, as old as the 13th century Spanish rabbi, Nachmanides, who moved to Jerusalem, as devout as the students of the Vilna Gaon who left Europe in the early 19th century, and as passionate as the Yemenite Jews who walked to the Holy Land in the 1880s. 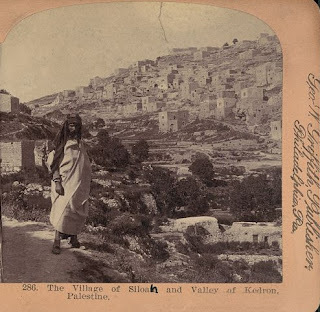 These "Zionists" comprised the "Old Yishuv," the pious Jews and their descendants who lived in the holy cities of Jerusalem, Hebron, Safed and Tiberias. 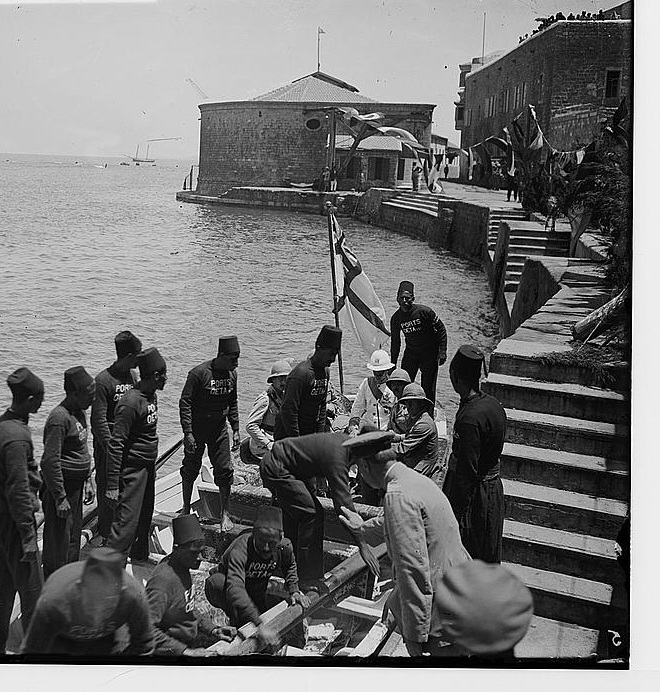 Many lived in the ancient city of Jaffa along the coast, but they were expelled by the Turks in 1917. 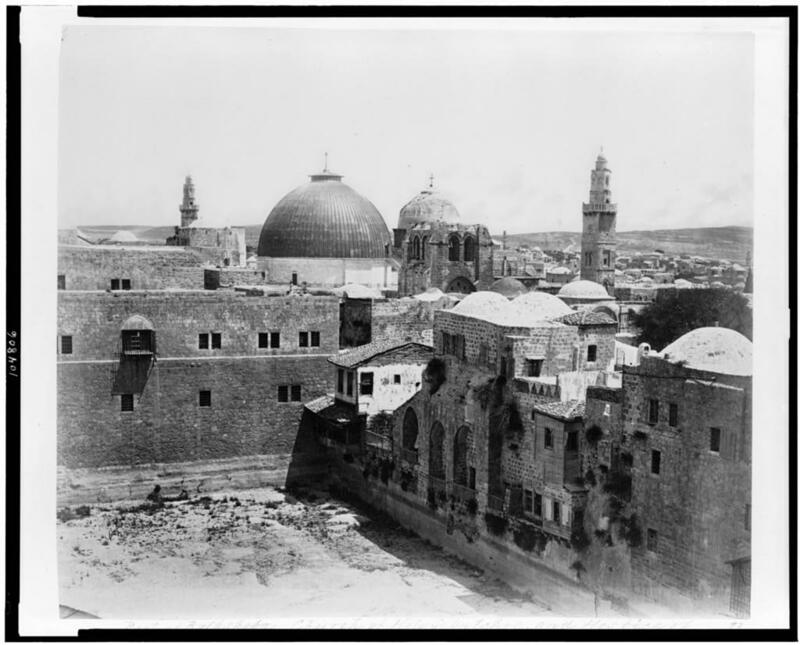 An "Arab Jew from Yemen"
In the late 19th century, Jewish nationalists began their aliya to the Land of Israel. The Zionists established national governing institutions and built cities, farming communities, universities, ports and industries. The photographers of the American Colony focused on many of these enterprises. Their collection is housed in the Library of Congress, the source of these vintage photos. 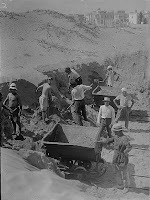 The building of the new city of Tel Aviv, north of Jaffa, was the jewel on the Zionists' crown. 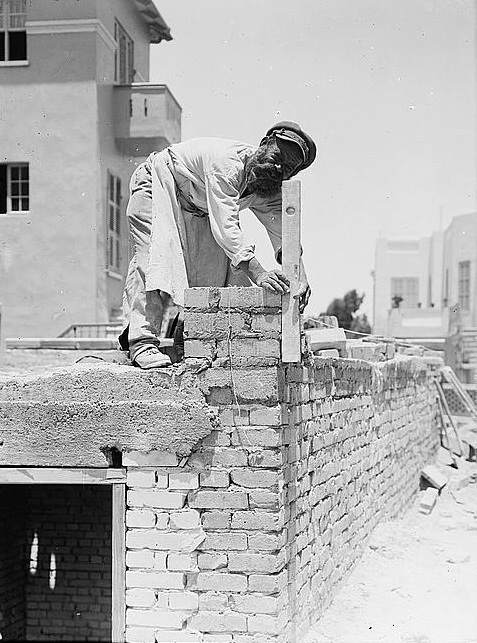 Already in the 1880s Yemenite Jews started to move north from Jaffa to build homes. 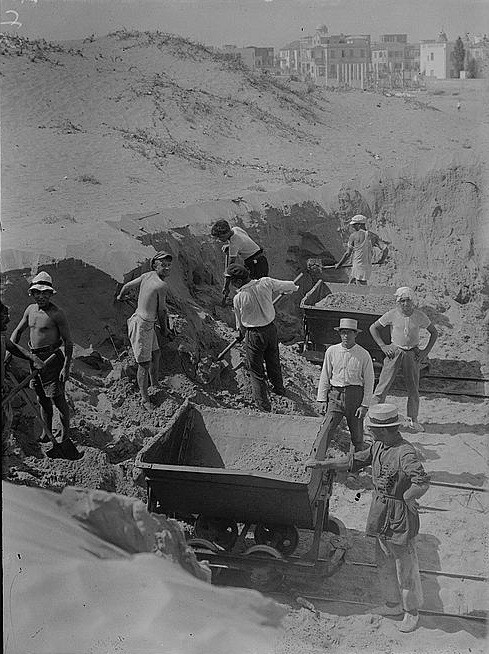 In 1909, a Zionist housing enterprise was launched in the sand dunes north of Jaffa with 66 families drawing lots to allocate property for new homes. 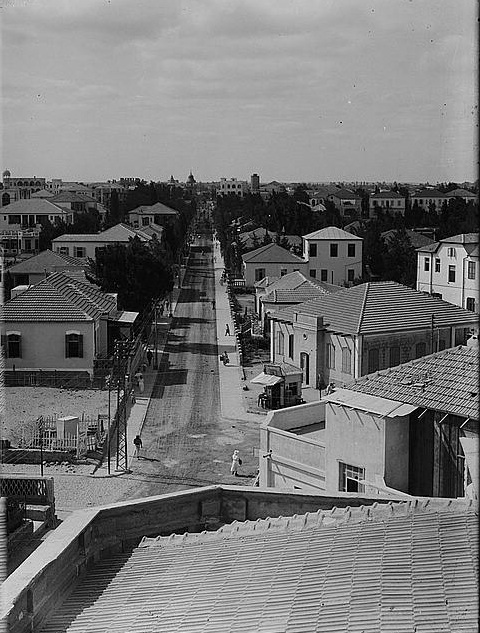 After the Turkish expulsion in 1917 and the defeat of the Turks by the British in 1917-1918 Jews moved back to the Tel Aviv area. ﻿ By 1925, 34,000 Jews were living in Tel Aviv. Twenty-three years later, in May 1948 and with Jerusalem under siege, Tel Aviv served as the capital of the newly proclaimed State of Israel. 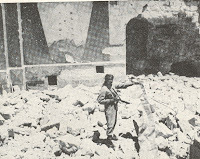 The members of the "Old Yishuv" in Jerusalem's Old City were evacuated or taken prisoner by the Jordanian Legion. 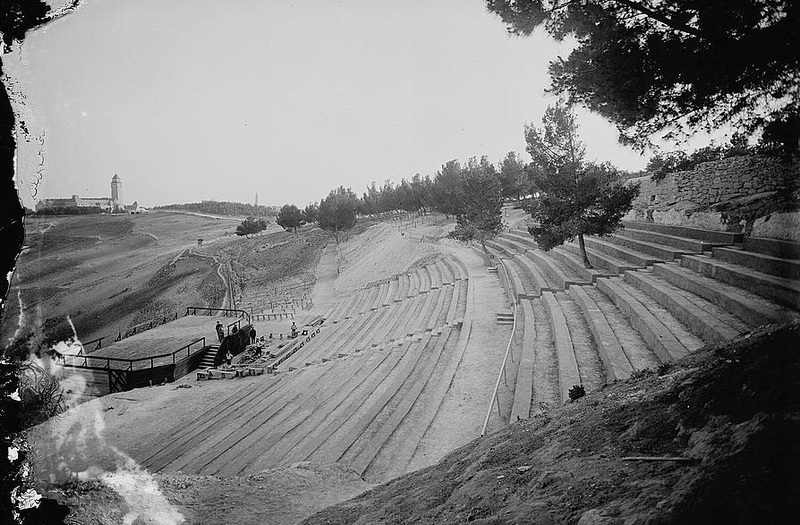 The members of the "New Yishuv" served on the defense line of the new state, with the rural kibbutzim and moshavim bearing the brunt of Arab attacks. The Turks Defeated the British in Gaza 95 Years ago, April 17, 1917. 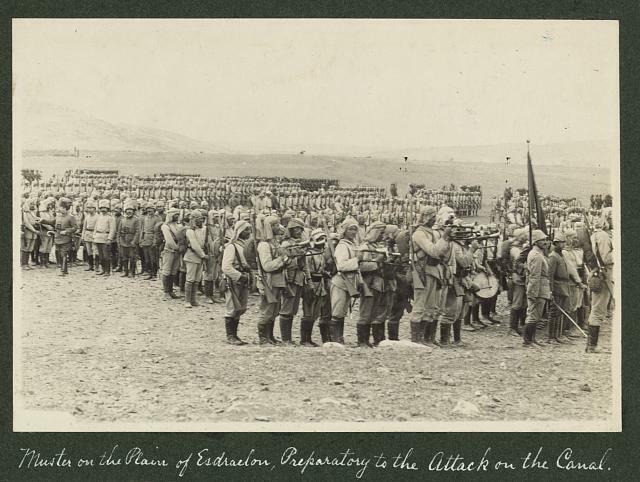 In early 1915, the Turkish army in Palestine crossed the Sinai and attacked British troops along the Suez. 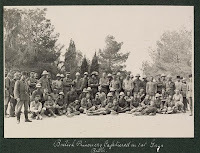 The British army beat back the attacks, took the war north into Sinai and pushed the Turkish army back to a defense line stretching from Gaza, located on the Mediterranean, to Be'er Sheva, some 40 miles inland. 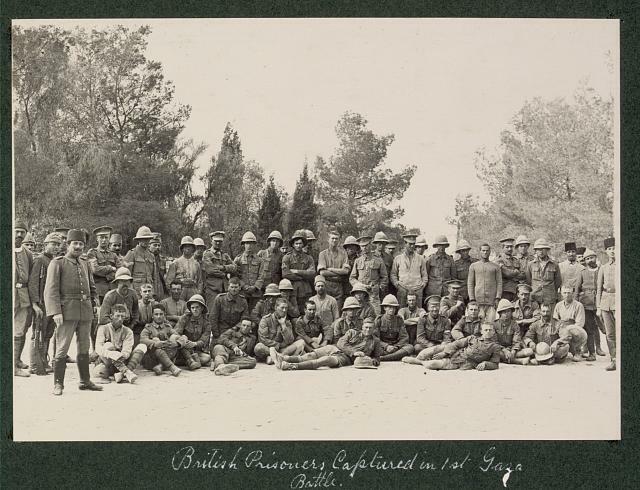 In March and April 1917 the British army attempted to push through Gaza in battles that involved as many as 60,000 soldiers. British and French ships fired on Gaza from the Mediterranean. The British used poison gas and deployed newly developed British tanks. And the British suffered a disastrous defeat. Click on pictures to enlarge. Click on the captions to view the originals. 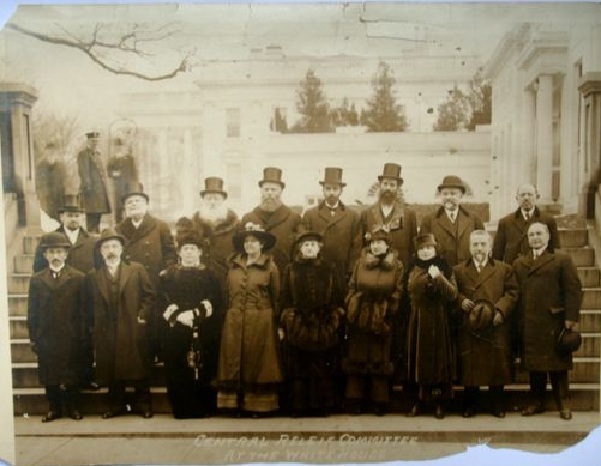 The caption reads "Central Relief Committee at the White House"
I actually have an original of photo of Rabbi Kook and his committee including my Great-Grandfather who served as a translator outside the White House after meeting the President. I had never seen this image until recently when I found it among his son's possessions when I cleaned out his apartment. Thank you Yitz and Menachem. I'm not sure I can identify Rabbi Kook in the photo under any of the top hats. If you have more photos please send them! Please let us know who in the picture is your great-grandfather. Was your grandfather Rabbi Aaron Teitelbaum who played an important role in the meeting, according to this account? 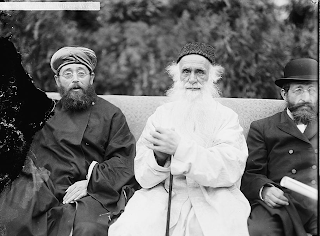 At the meeting, Rav Kook thanked the President for his government’s support of the Balfour Declaration, and told him that the return of the Jews to the Holy Land will benefit not only the Jews themselves, but all mankind throughout the world. He quoted the Talmudic sages as saying that no solemn peace can be expected unless the Jews return to the Holy Land, and therefore their return is a blessing for all the nations of the earth. Rav Kook also expressed the gratitude of Jews throughout the world towards the American government for aiding in relief work during the war. He said that America has always shown an example of liberty and freedom to all, as written on the Liberty Bell, and that he hoped that the country will continue to uphold these principles and render its assistance whenever possible. The speech, written in Hebrew, was delivered in English by Rabbi Aaron Teitelbaum, executive secretary of the CRC. Rav Kook answered “Amen”, and explained that since he wasn’t fluent in English, he had Rabbi Teitelbaum read his message. By answering “Amen”, he indicated that he consented to every word that had been read. The President responded that the American government will be glad to assist Jews whenever possible. Before leaving Washington, Rabbis Kook and Teitelbaum held a meeting of local rabbis and community leaders to raise money for the Torah Fund. Rabbi Abraham Isaac Kook, the Chief of Rabbi of Palestine, began his journey to America in March 1924. Joined by two prominent rabbis from Lithuania, the delegation was met in New York with great respect and ceremony. See previous posting on Rabbi Kook's meeting with President Coolidge in the White House. Rabbi Kook's boat was met in the New York Harbor by hundreds of Jewish leaders. The rabbis were escorted to a meeting with New York's Mayor John F. Hylan by a "squadron" of police motorcycles and a 50-car procession. The Mayor welcomed "the distinguished Jews from the old world.... We are privileged," he continued, "to greet teachers and spiritual leaders whose intellectual achievements are in themselves worthy of special recognition." 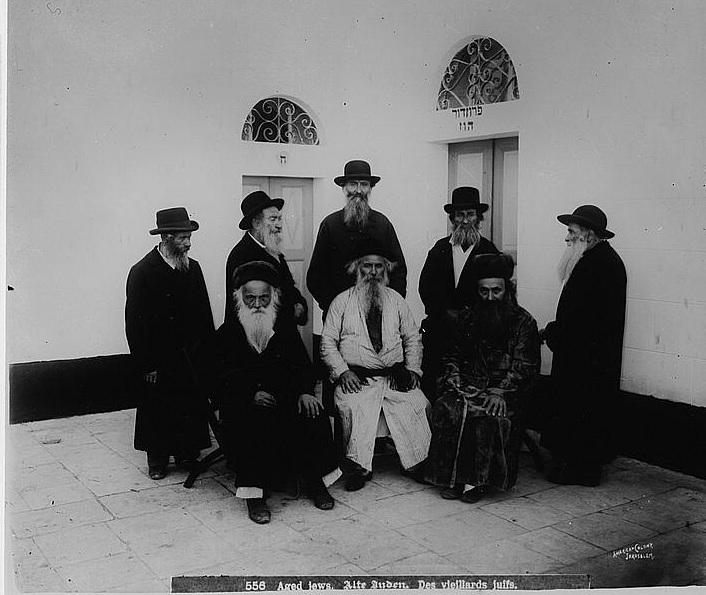 "Rabbi Kook and his companions have undertaken the long and fatiguing journey to the United States and Canada to deliver in person a message to their co-religionists [that] unless the Jewish schools and seminaries in Eastern Europe and Palestine continue to receive ... the support of the American Jews, hundreds of ...educational institutions will have to be closed in 1,300 Jewish communities in the war-stricken lands of Europe. A half a million children... will grow up without religious and secular education..."
"Rabbi Kook of Palestine... is a man of rare mental attainments. He is a renowned theologian, poet, philosopher and humanitarian. At the age of 18 he had already several books on ethical and philosophical topis to his credit for which he received a doctorate degree from the Berne University. From his youth Rabbi Kook was enamored with the Holy Land. 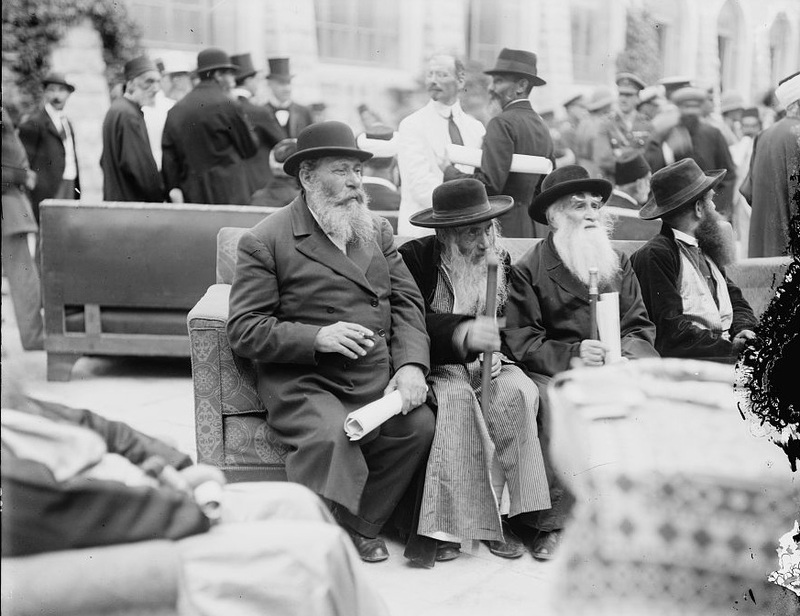 At the outbreak of the world war Rabbi Kook happened to be in Switzerland. 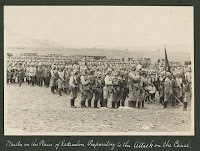 Owing to his pro-ally sentiments, the Germans refused him permission to return to Palestine... 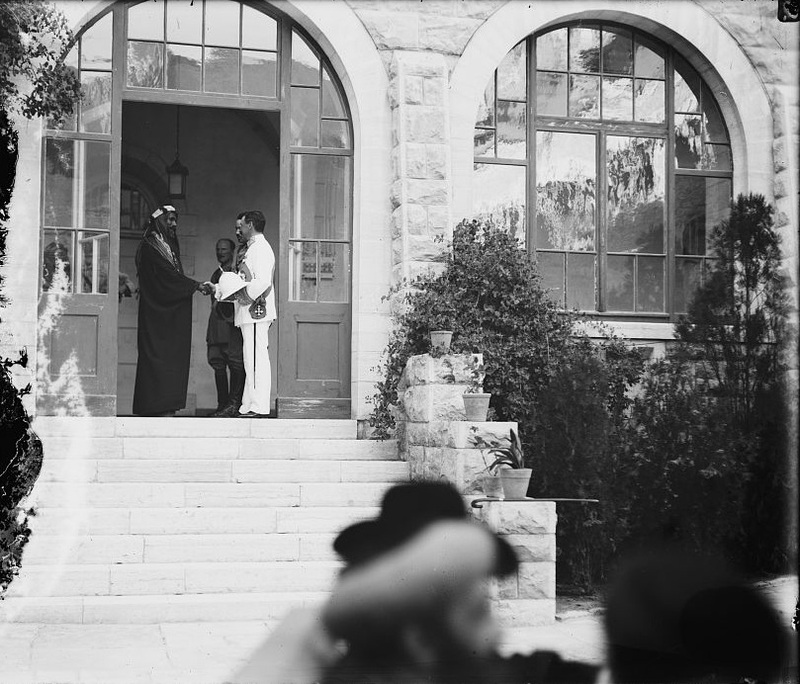 When General Allenby liberated Palestine, Rabbi Kook returned to Palestine and was immediately elected Chief Rabbi of the Holy Land and officially installed in this high office by the High Commission, Sir Herbert Samuel..."
The Arab village of Deir Yassin is the subject of one of the biggest controversies of Israel's 1948-49 War of Independence. 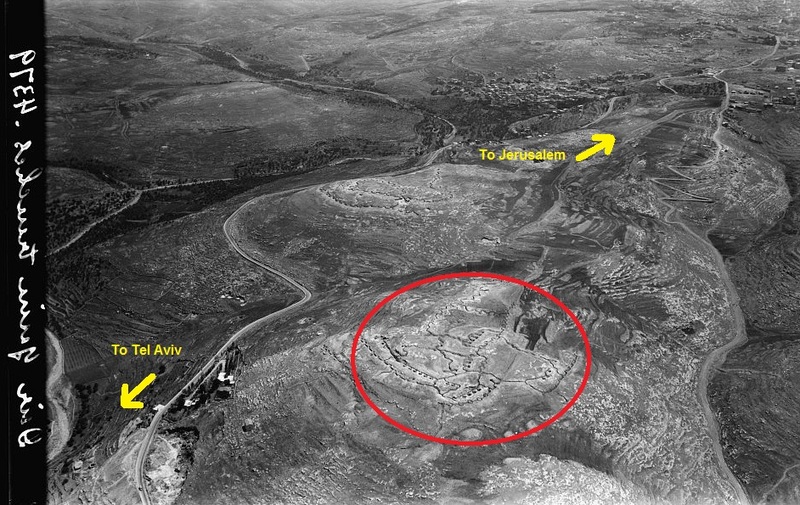 The village, situated on the road immediately outside of Jerusalem, was part of the Arab vise putting Jerusalem under siege. 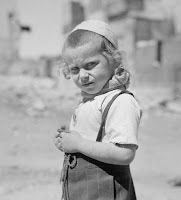 Israel's detractors portray the village as a pastoral, innocent victim of Jewish atrocities and ethnic cleansing in April 1948. 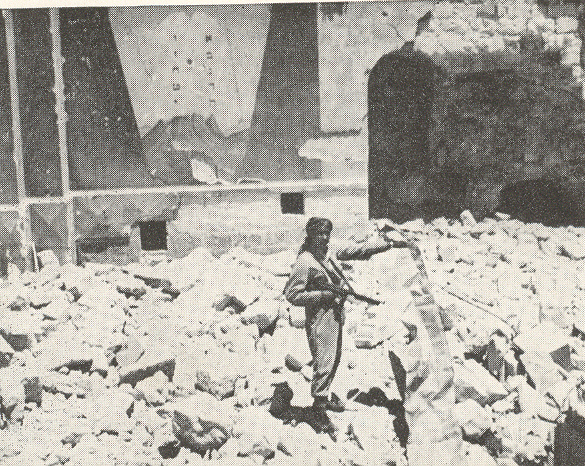 Jewish fighters (Israel had not yet been founded) claim that Arab combatants were in the village. New research and Arab interviews confirm today that the civilian casualties of Deir Yassin were far fewer than claimed by Arab spokesmen. Another view of the trenches of Deir Yassin. 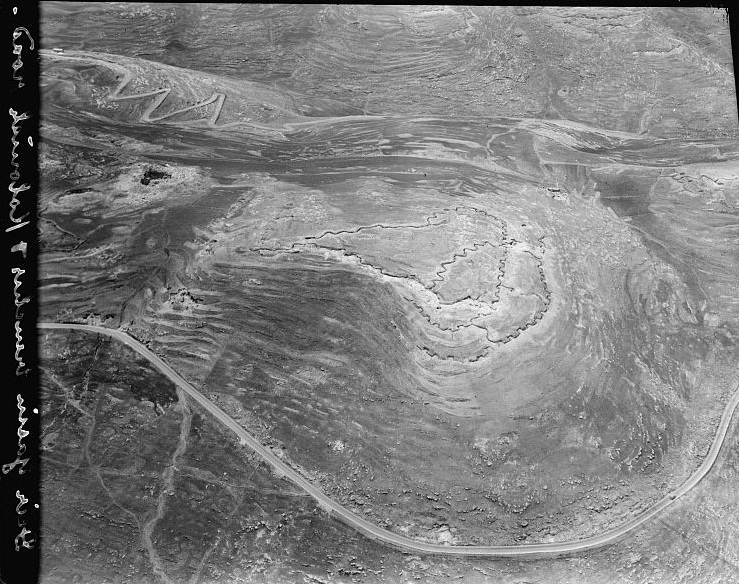 The aerial pictures from the Library of Congress collection were taken in 1931, and possibly earlier, and show the village's strategic location. 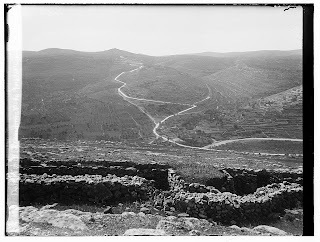 They show Deir Yassin commanding the road between Jerusalem and Jaffa - Tel Aviv as well as the Turkish-built trenches and fortified defense lines. Click the pictures to enlarge, click on the caption to see the originals. 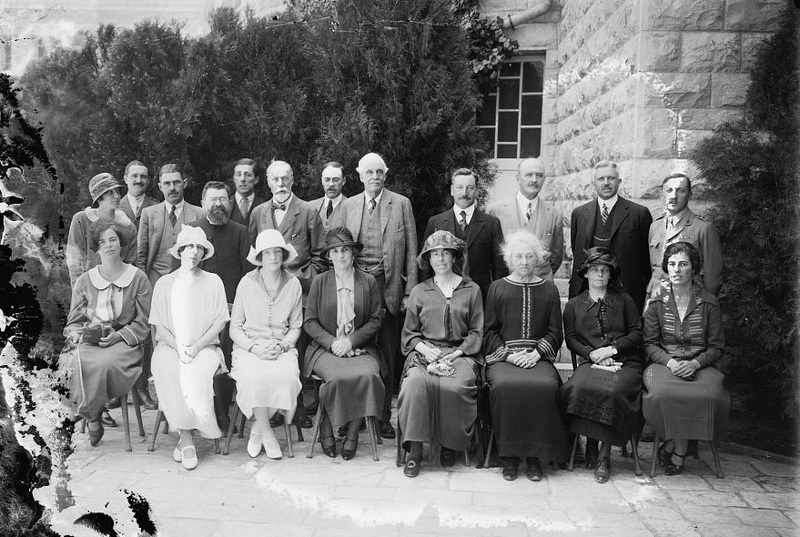 April 1 -- The Anniversary of Hebrew University's Opening in 1925. ﻿The establishment of the Hebrew University on Mt. 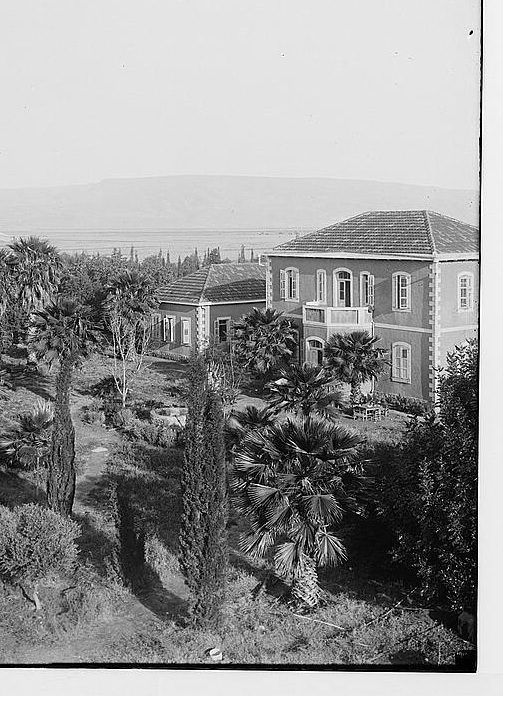 Scopus was clearly a momentous event in the minds of Zionist leaders who had dreamt of such a Jewish university since the 1880s. It was also important to the American Colony Photo Department whose collection is housed today at the Library of Congress. Their photographers shot pictures of many of the university's events. 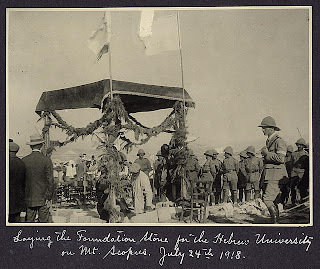 The first photograph commemorates the laying of the foundation stone of the Hebrew University on July 24, 1918, just eight months after British forces captured Jerusalem in a major and bloody campaign. ﻿ On April 1, 1925 a ceremony was held on Mt. Scopus to announce the official opening of the university. 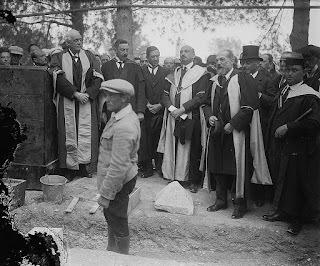 Lord Balfour and Chaim Weizmann, a Zionist leader who would later become Israel's first president, were among the leaders to speak at the gathering. 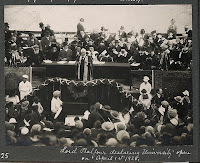 Lord Balfour, who, serving as British Foreign Secretary, drafted the Balfour Declaration on November 2, 1917. 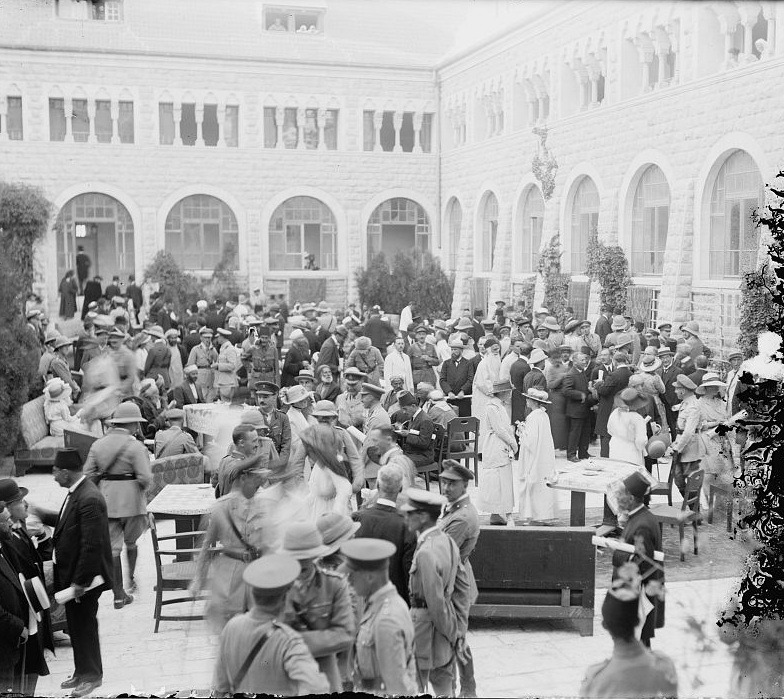 The document declared, "His Majesty's government view with favour the establishment in Palestine of a national home for the Jewish people." In the picture (right) Balfour is speaking, Weizmann is behind him on the right and the chief rabbis are behind him on the left.. Another historic picture of the event can be found here. The speaker is British High Commissioner Herbert Samuel.